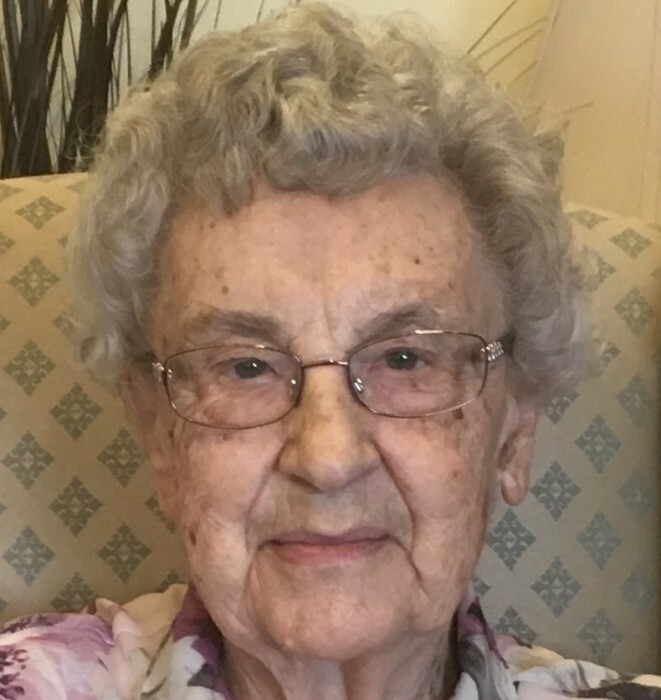 Irma Nelson, daughter of Delta and Howard Fletcher, and loving wife of Louis Nelson, died of natural causes the morning of January 28, 2019 at the Memory Care Cottage of Royal Oak Village in Lacombe. Irma is survived by her three daughters Judith, Frances and Brenda. She is also survived by four grandchildren (Breanna, Megan, Nicholas and Matthew), 6 great grandchildren (Tristan, Isaac, Hailey, Katelyn, Addison and Jack), step great grandchild Maddox, and predeceased by her grandson Michael. Irma was born July 15, 1926 in Calgary, Alberta. Irma worked as a secretary with a law firm prior to her marriage and then stayed home to raise her three daughters. She did work for a short time again in the 70’s as secretary to the head of emergency at the Foothills hospital. Upon moving to Lacombe, Irma worked for a short period with the Lacombe public library. Throughout her life she always used her skills as a typist and secretary to volunteer for the church and of course, to type her daughters’ university papers. Irma was a stickler for correct grammar and spelling! Irma and Louis moved from Calgary to Lacombe in 1978 when Louis’s corporation, AFSC, relocated its head office. Irma’s greatest delight about the move from Calgary to Lacombe was it allowed them both to be closer to their cottage at Gull Lake. Church was an important part of Irma’s life and she enjoyed playing the piano for Sunday services. She continued to gain pleasure from playing music to the very end of her life. Irma will be most remembered for her sweet disposition and gentle nature. A private family gathering will be held to celebrate her life. The family will be forever grateful for the kind and loving support of the staff at Royal Oak and for the love of her companion and care aide, Corry Van Der Scheer.